This eight-session small group Bible study, Life & Ministry of the Messiah, from noted teacher and historian, Ray Vander Laan, is volume three of the 12-part Faith Lessons series. In it, Vander Laan illustrates how Jesus' call to follow him turned the world upside down. Journey back to the time of Jesus. Marvel at the magnificence of Herod's palace. Scramble among the ruins of Qumran. And wonder at the simplicity and wisdom of Jesus' parables. In the Life & Ministry of the Messiah, you and your group will discover how the events of Jesus' day impacted his life, ministry and communication…and then you'll learn how it affects yours. Includes 30 personal Bible studies to help you deepen your learning experience between sessions, and turn lessons from the past into applications that impact how you live out your faith today. 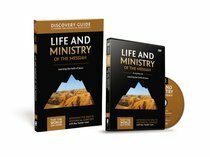 About "Life and Ministry of the Messiah (Discovery Guide With DVD) (#03 in That The World May Know Series)"